It is not an earth-shattering achievement, but I am pleased to have been blessed to visit most of the Bible World over the past 50 years. The only major country that eluded me is Iran. At one time I knew a couple working for an American corporation in Iran. The wife was visiting family near me and brought me eight historical and travel books about the country which are still on a top shelf in my study. She encouraged me to bring a group to the country. Not long afterwards there were many political changes in Iran and the tour never materialized. But I have been greatly blessed to travel and to share my experiences with many others. In 2007 I began a little blog on WordPress to keep family and friends of those on my tour updated to our activities. This is now the 2000th post on ferrelljenkins.wordpress.com and ferrelljenkins.blog. The last 100 or so have been slow in coming, but finally we have reached that milestone. 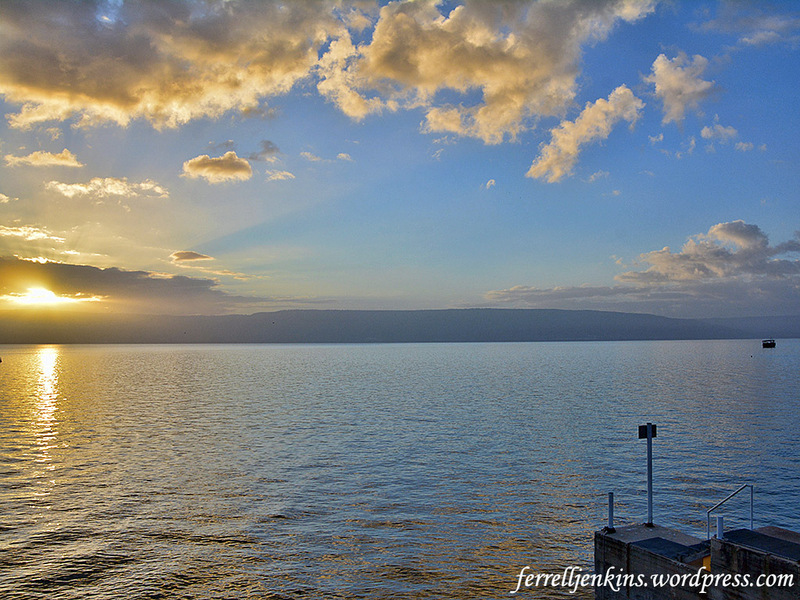 Post number 2000 for ferrelljenkins.blog. 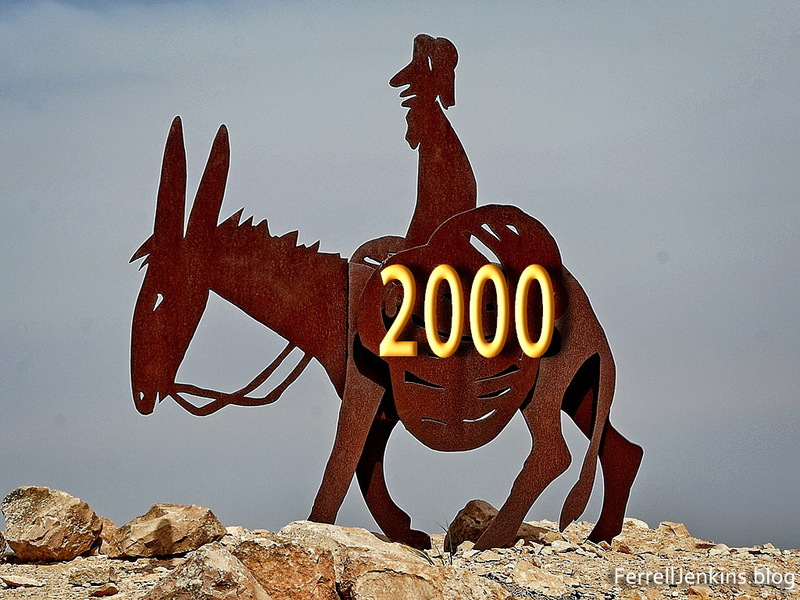 This photo, without the 2000, was made at Avedat in the Negev of Israel. Some of our blog posts have been tour reports, others have been more significant, and hopefully helpful, posts for all Bible students. A few posts have been repeats with updated information or photos. 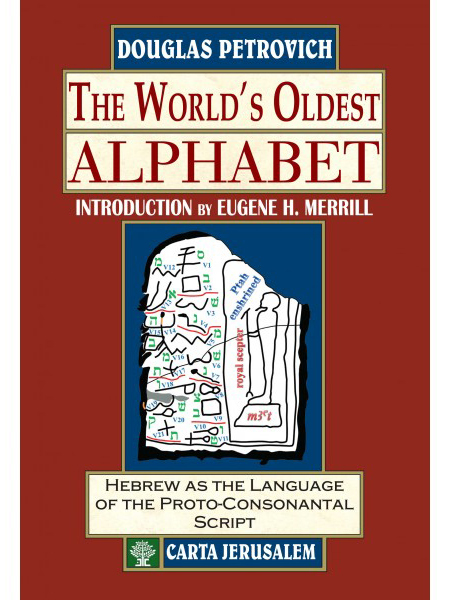 My hope is that you think of this blog as a sort of (incomplete) Bible Lands and Customs Dictionary. Use our indexes and the search box to locate places and customs you may be studying. I wanted to share a few beautiful photos as a sort of celebration of the 2000th post. 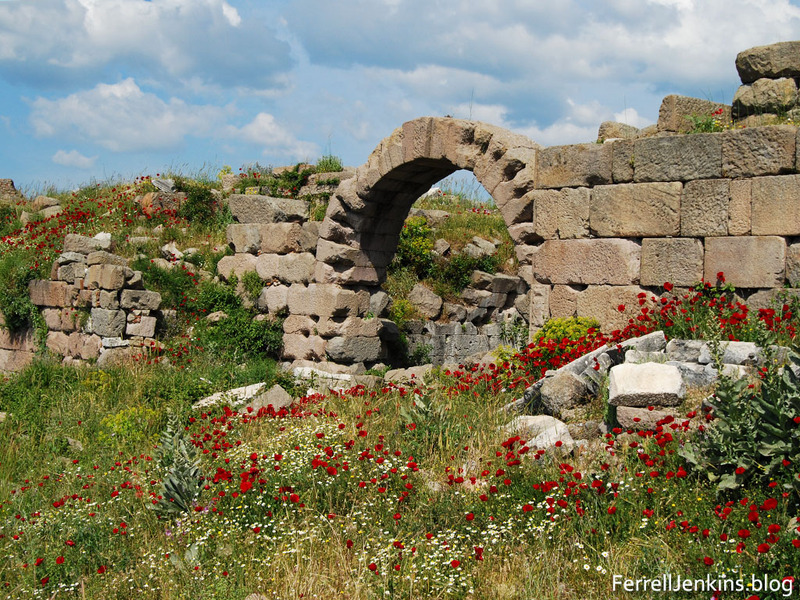 Spring flowers among the ruins at Pergamum, site of one of the seven churches of the book of Revelation (2:12-17). Photo by Ferrell Jenkins. In addition to my 50 years of tours in the Bible World and other parts of the world, I have made numerous extended trips with just another person, or up to three others. On these excursions we have been able to visit some places not easily accessible to a group with a bus. Beginning in about 1980 I have made these excursion with Melvin Curry, Phil Roberts, Harold Tabor, Jim Hodges, Raymond Harris, Curtis and Kyle Pope, David Padfield, Gene Taylor, Lowell Sallee, David McClister, Larry Haverstock, Dan Kingsley, and my lovely wife Elizabeth. Leon Mauldin has joined me on more of these personal trips than anyone else; no less than ten. Just as soon as I publish I will surely think of someone else. 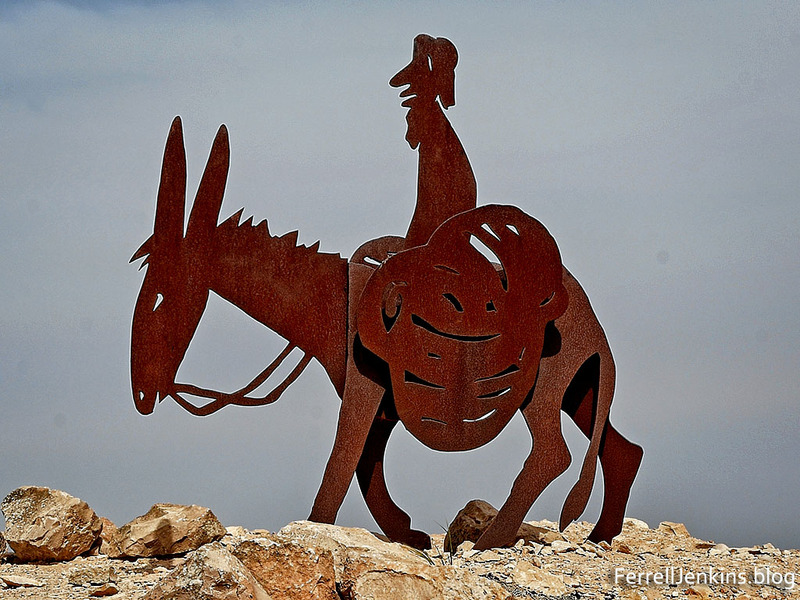 One way I sometimes describe my travels, and these are included on the blog, is by a biblical timeline – from Ararat to Patmos (or Genesis to Revelation). 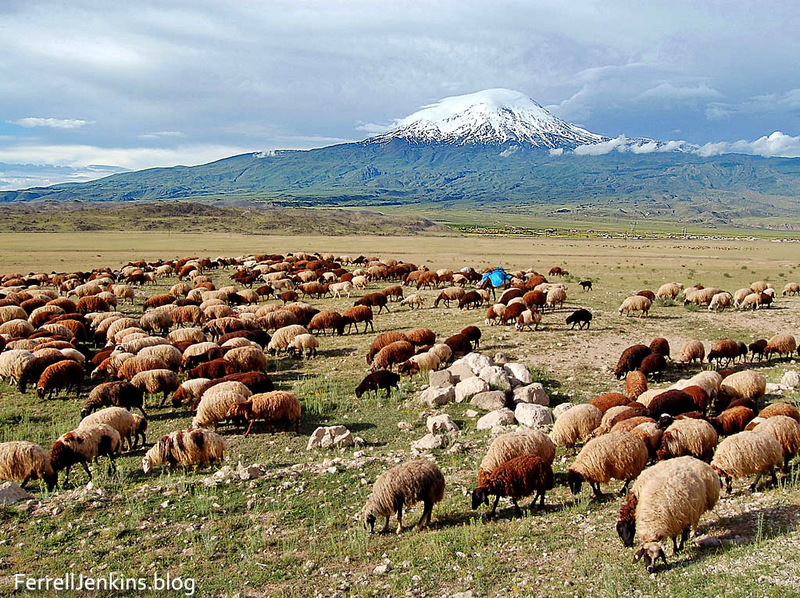 We have discussed the possibility other sites for the biblical account of Noah and the Flood, but here is one photo of Greater Ararat in northeast Turkey. Greater Mount Ararat, in the land of Ararat, near the Iranian border. This is the traditional site of the landing of Noah’s ark. Photo by Ferrell Jenkins. 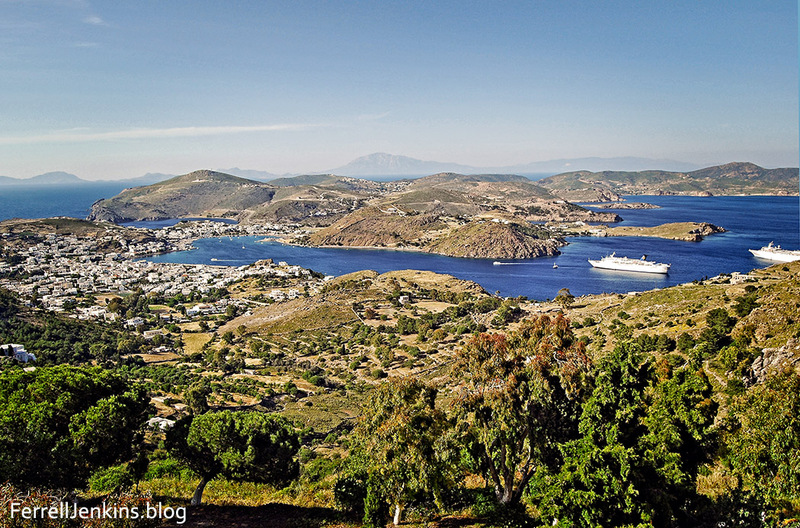 And here is a photo of the little Greek island where John was exiled in the later years of the first century A.D.
A view of the harbor on the island of Patmos, the place where the apostle John received, and possibly wrote the Book of Revelation. Photo by Ferrell Jenkins. 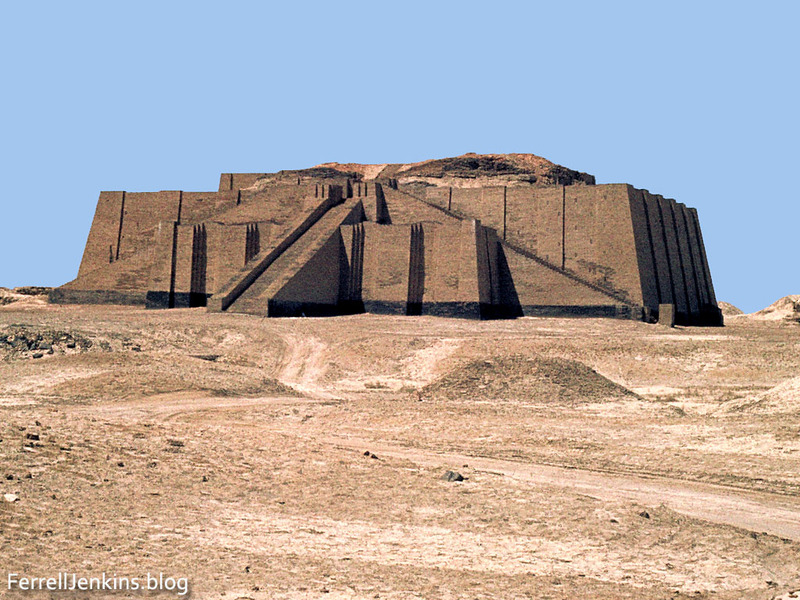 The ziggurat at Ur, Iraq. The remaining ruins can be seen above the reconstructed brick work. The reconstruction is about four stories high. Photo made by Ferrell Jenkins, May 13, 1970. If we follow the New Testament epistles to the west we come to Rome, the city where both Paul and Peter are said to have given their lives for the cause of Christ. 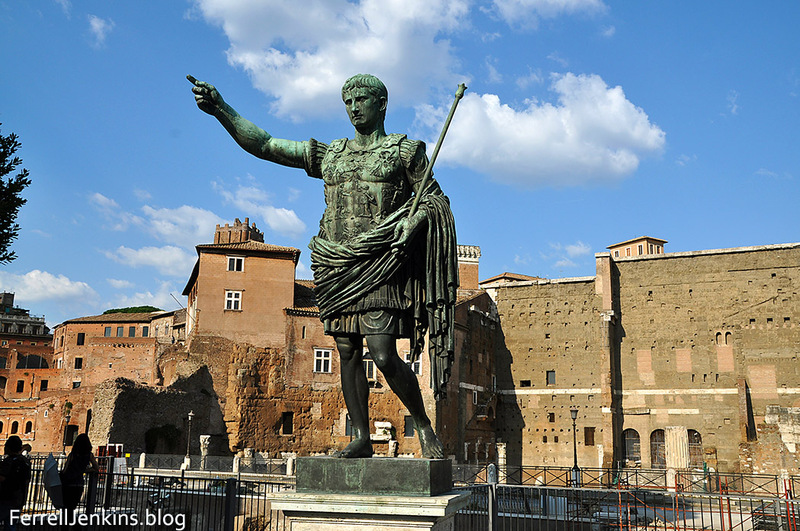 The statue of Emperor Augustus reminds us of the power of Rome from the birth of Jesus to the close of the New Testament. Replica of a statue of the Emperor Augustus in Rome. Photo by Ferrell Jenkins. I have made numerous friends as a result of the blog. My first knowledge of Todd Bolen came through his Pictorial Library of Bible Lands, and we corresponded on a few items before we met. We first met in November, 2005, in Jerusalem. 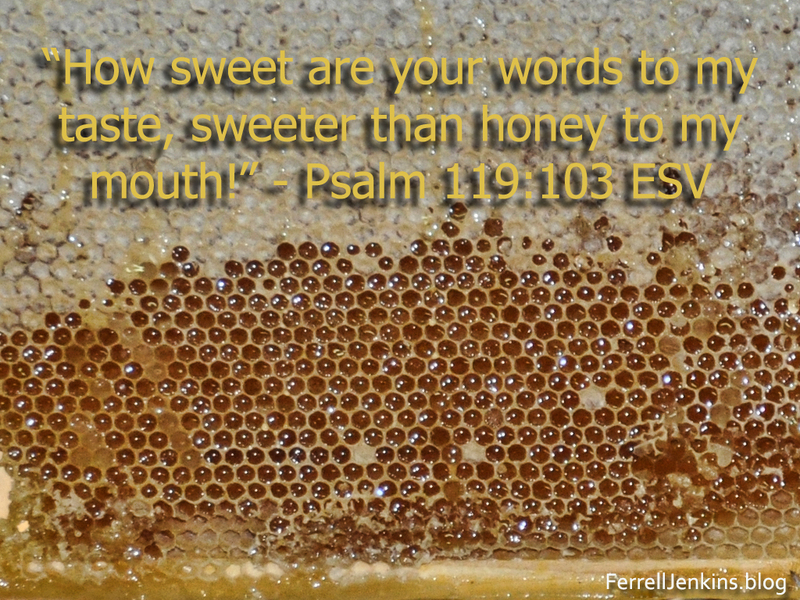 He frequently mentions my posts on his weekly roundup at BiblePlaces Blog. I am pleased that he now licenses my photos to publishers who wish to use them. Other bloggers who have encouraged me include Carl Rasmussen (HolyLandPhotos blog), Charles Savelle, Wayne Stiles, and Steve Wolfgang for his frequent re-blogging of my posts. Tom Powers has helped me correct or avoid a mistake more than once. And a host of friends who have encouraged me by letting me know they read and use our photos and learn from our comments. Without a count, I am confident that Joseph Lauer has more Hat Tips (HT) than anyone else. Many thanks for all the helpful updates he has provided. I should add three of my former students and travelers who are now leading tours. Barry Britnell, Luke Chandler, and Leon Mauldin all have high recommendations from those who travel with them. If you have enjoyed and profited by following this blog will you please tell at least one friend about it? Many thanks. This post will be linked to our Indexes (Indices) page that you see listed above our header photo. These articles are fairly easy to locate through use of the Search box, but I receive questions about the subject several times a year. If you locate another one of our posts that should be on this page please let us know in a comment. We will not add links from other sources here. 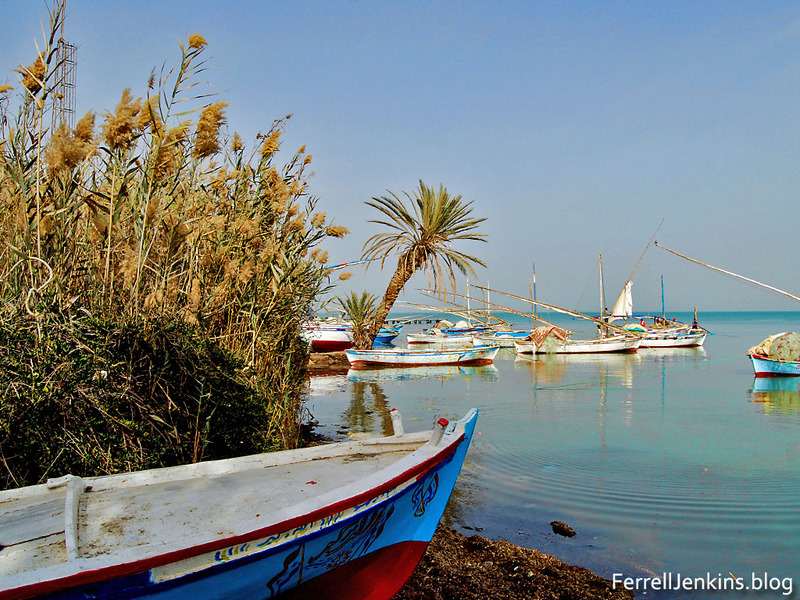 An area along the Suez Canal (Red Sea = Sea of Reeds). Photo by Ferrell Jenkins. 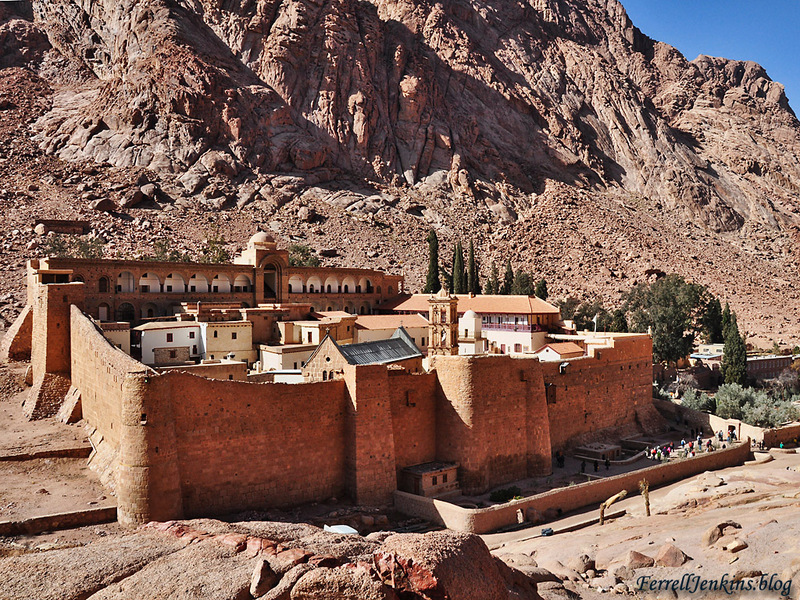 The Monastery of St. Catherine at the foot of Jebel Musa, the traditional Mount Sinai. Photo by Ferrell Jenkins. The change is so subtle that you probably didn’t even notice that the address bar or location line now reads https://ferrelljenkins.blog/. Anyone who can spell Will Ferrell and Florence Foster Jenkins can handle ferrelljenkins. Our first post was dated May 2, 2007. This is now our 1984th post. Admittedly some of the posts are insignificant (like this one). But I think that many of the posts continue to be helpful to Bible students and teachers who are searching for information, and photos, of Bible lands and customs. You may ask, “Why did you change the domain, and if it is important why did you not do it sooner.” Here are a few reasons. This blog has been hosted free of charge by WordPress all these years. For a long time there were no advertisements appearing with the blog, but lately that has changed. I can’t blame WordPress. The company wants to make a profit. To do so they sell services including ads for the blogs they host. Sometimes these ads showed up in the right column. Others showed up at the bottom of a post. I noticed them especially when searching for a particular subject such as Bethlehem or shepherds (just examples). Some ads were innocuous, but others promoted viewpoints that I do not hold or approve. WordPress has been peppering me with Emails advertising new URL’s. The hundreds of photos that have appeared here and the tremendous cost to procure them have been covered exclusively by me. It is true that I do license a few photos for various publishers, but this would not pay for my flight from Tampa to New York, let along to Israel, Jordan, Turkey, Egypt, or Greece, to mention a few of the places we have traveled to study and make photos. It takes a lot of travel and work to prepare Ferrell’s Travel Blog. No complaint. I consider this work part of my service to the LORD and His servants who want to enhance their understanding of the Bible. Those who have followed the blog for any length of time have undoubtedly noticed that my posts have been few and far between in the past two or three years. This is due to some health issues in my family. Often I prepare photos for presentation but never get around to writing the information to accompany them. Not promising, but I do hope to do better in the months to come. Many thanks to our faithful readers. Will you do me a favor? Send an Email to a few friends and encourage them to follow this blog. This means they will be notified each time we post something. The blank to fill in to be added to the list is near the top of the right column. By the way, if you have a link or bookmark to the old URL it will still work, but change it for future use. This is a re-post from USA Inauguration Day in 2009. 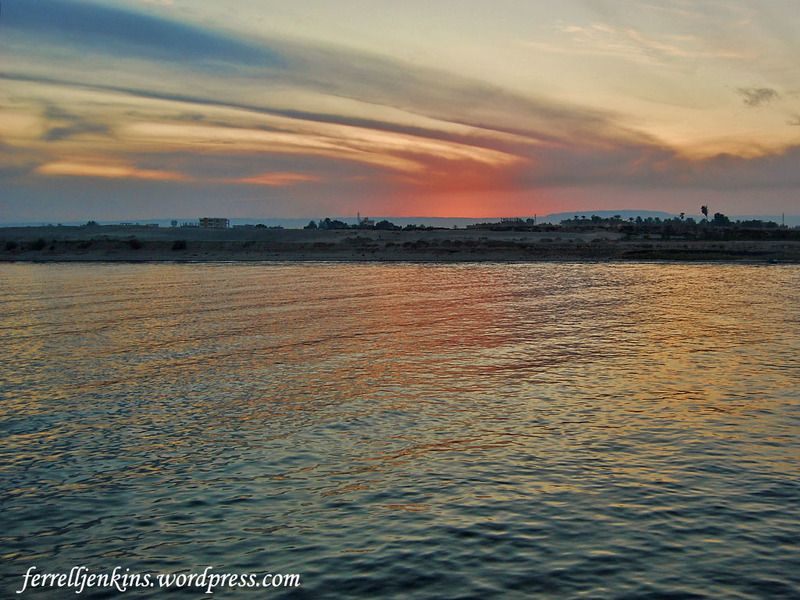 Shortly before sunset, January 20, 2009, I made a few photos of the Nile River looking toward the west bank of the river. I thought I would share this one with you. Sunset on the Nile, January 20, 2009. Photo by Ferrell Jenkins. We are anchored on the Nile a few miles south of Luxor. From my cabin on the Tu Ya cruise boat I am watching the Al Jazeera Network live coverage of the inauguration ceremonies in Washington. The choice of the majority of voters on November 2 was not my choice, but I must say that I am proud at this moment to be an American. The American ideal of freedom and justice for all is a noble one. Surely there are times when this ideal is not met, but it remains the dream that holds us together, many as one. The diversity of our nation is a testimony to the vitality of that dream. The inaugural ceremony is the same whether watching it live in Washington, on Al Jezeera in Egypt, or on CBS, NBC, CNN, Fox, or one of the other networks in the United States. Well, maybe. The thing that makes the difference is the commentary afterwards and the news chosen to run underneath the live event.